Although Duchenne has been studied for many years, classic measures of disease progression rely on basic observations of movement, such as the six-minute walk test. These measures pose a significant challenge for researchers because incremental disease improvement may go unnoticed. In addition, these measures don’t apply to non-ambulant patients, who may benefit from new treatment candidates, and who are currently not eligible for clinical trials. With the funds raised in 2016, we are funding a project that involves analysing blood-based samples with the aim of establishing molecular signatures that correlate with stages of Duchenne, which can then be measured through blood tests. If successful, this technique may provide an alternative, more informative measure of therapeutic efficacy in clinical trials. The project is being managed by Solid Biosciences. 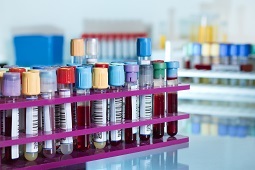 In medicine, a biomarker is a biological feature that can be used to measure the presence or progress of a particular disease. Biomarkers can be used to assess the effectiveness of a particular treatment in helping to alleviate the effects of a disease. We are helping fund development of new biomarkers for Duchenne that aim to monitor the progression of Duchenne more effectively and measure patients’ response to new treatments in clinical trials.